Keeping it simple is one of the guiding principles for all content designers. We try to apply it to everything we do, but when the content we’re working with is extra-complicated, it’s not always easy. The Digital Marketplace alpha has presented us with the perfect opportunity to practise what we preach. The Digital Marketplace should make it as quick and easy as possible for public sector organisations to find and buy digital products and services when they need to. This means we have to structure content in a clear and easy-to-understand way. 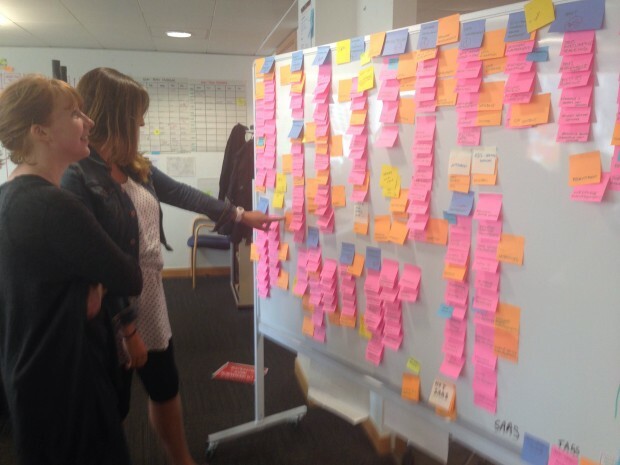 Defining and organising huge volumes of technical content into online categories is about as complicated as it gets. There can be no room for ambiguity. With a limited number of words to describe each category, any loose phrasing or misplaced word can have a dramatic effect on how and whether users find what they’re looking for. Over the last few weeks, we’ve been thinking about how we can organise hundreds of different IT services on the Digital Marketplace. Our first task was to list and group the services that sit in the Software as a Service (SaaS) category. We started by identifying over 200 IT services, which cover everything from accounting to patch management. Our next step was to organise these services under meaningful headings. It didn't take long for us to realise that different descriptions mean different things to different people. While a Human Resources specialist might expect to find time-tracking software under the heading ‘Human Resources and Employee Management’; a project manager may expect to see the same service under the heading ‘Project Management and Planning’. Google Analytics from the CloudStore also showed that people are searching for terms we hadn’t even considered. A lot of card sorts, tree tests and post-it notes later, we started to make changes to some of our category headings. We decided to lose our ‘Web’ category, which was being interpreted in lots of different ways, and house its services under different, more meaningful, headings. Next, we changed ‘Communications’ to ‘Telecoms’ to help focus the kind of services users might expect to find there. We also realised that it was fine for the same service to live under different category headings. Faceted navigation might be one way to accommodate a more flexible approach. Over the coming weeks, we’ll be taking an even closer look at how we’re describing things to make sure we’re presenting suppliers’ services in the best way possible. If you’re a buyer or supplier, you can help us define and refine our content. Please sign up to our user research to help us shape the new Digital Marketplace. Follow the Digital Marketplace on Twitter, and don't forget to sign up for email alerts. I believe this is the single most challenging aspect of managing a growing and complex website, I look forward to reading more on how to overcome the issues tthat plague us all.